The Orion capsule falls to Earth with parachutes deployed at Yuma Proving Ground, Arizona, on July 24, 2013. NASA's Orion capsule, planned to be the space agency's next manned spaceship, safely landed during a flight test today (July 24) using just two of its three parachutes. The test was the 10th in a series of maneuvers to check out Orion's parachute system, which will slow the vehicle down as it plummets through Earth's atmosphere on return trips from space. Orion is designed to carry astronauts beyond low-Earth orbit to nearby asteroids, the moon, and eventually Mars. The spacecraft is due to make its first test flight to space in 2014 in a mission called the Exploration Flight Test-1, and its initial crewed flight around 2021. The Orion capsule falls closer to the ground with parachutes deployed at Yuma Proving Ground, Arizona, on July 24, 2013. "The closer we can get to actual flight conditions, the more confidence we gain in the system," Chris Johnson, project manager for the Orion capsule parachute assembly system at NASA's Johnson Space Center in Houston, said in a statement. "What we saw today — other than the failures we put in on purpose — is very similar to what Orion will look like coming back during Exploration Flight Test-1's Earth entry next year." Orion is equipped with three parachutes to slow its fall, but is designed to need only two of them. During today's test, engineers simulated the failure of one chute to confirm that the other two were adequate. The team caused one parachute to fail during the descent to understand the effects of a chute pulling away in mid-flight. 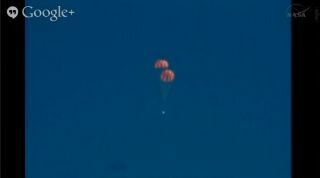 "We wanted to know what would happen if a cable got hooked around a sharp edge and snapped off when the parachutes deployed," Stu McClung, Orion's landing and recovery system manager at Johnson, said in a statement. "We don't think that would ever happen, but if it did, would it cause other failures? We want to know everything that could possibly go wrong, so that we can fix it before it does." During Orion's 2014 test flight, the capsule will launch atop a Delta IV rocket to reach a distance of 3,600 miles (5,800 km) from Earth, well beyond the orbit of the International Space Station. For its eventual deep space missions, the capsule will be launched by NASA's heavy-lift Space Launch System (SLS) rock, which is currently in development.